Asset allocation matters. People are often told by their financial advisers that they need to pick the right stocks and funds in order to do well in the market. While your investment choices does have an effect on how much money you make or lose in your investment portfolio, studies show that your asset allocation likely effects your portfolios performance more than your choice of individual funds or stocks. I learned this last year by reading Daniel Solin’s book, The Smartest Investment Book You Will Ever Read. Daniel Solin recommends investing in index funds due to their lower cost. While there is nothing wrong with this advice, I have found mutual funds that have outperformed their respective indexes in the long run such as NASDX and PONDX. Of course, just because these funds have outperformed their respective indexes does not mean they always will. 1. 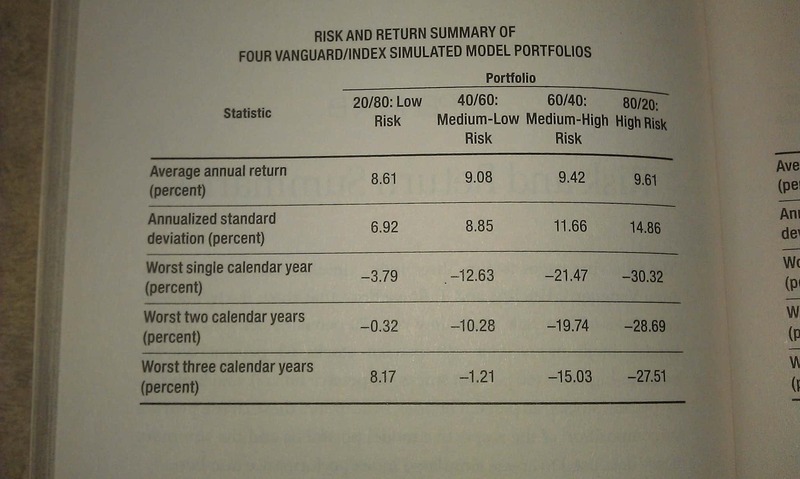 The portfolio with 80% bonds and 20% equities had an average return of 8.61% and its worst single calendar year was -3.79% (by the way, all of these averages include the recession). 2. The portfolio with 60% bonds and 40% equities returned an average of 9.08% and its worst single calendar year was -12.63%. 3. The portfolio with 40% bonds and 60% equities returned an average of 9.42% and its worst single calendar year was -21.47%. 4. The portfolio with 20% bonds and 80% equities returned 9.61% annually and its worst single calendar year loss was -30.32%. Overall, history suggests you probably will make the most money over a period of time with the 20% bond/80% equity portfolio. When the portfolio goes up in value, it goes up very quickly. On the flip side, it can go down very quickly too. Most advisers suggest moving more towards bonds as you get closer to retirement.